Happy to say that the table is done and with the help of a neighbor it’s on the patio ready for the first outdoor meal! Always rewarding to see anything you “conjured” up in your mind, then put on paper, actually come to life and have it look just as you imagined. In the last blog the trestle was complete and there was an issue with the Watco Exterior Oil. Although this finish has mixed reviews I’m willing to give it a try since I really do not care for surface coatings that inevitably crack and peel resulting in lots of sanding prior to refinishing. Since this table will be under cover most of the day the plan is to refresh the finish every 6 months or so with the Watco thinned down to help penetration — I’ll try to keep you up to date as to whether or not this will work. Assembling the top went as I hoped, after assembling the two ends and center pieces to one side work began on the infill pieces. Since the Alder was random width it took some math calculations to determine their sizes. Worked out that with the 1/4″ gap between they ranged from 5″ to 5 1/4″ so the variation is barely noticeable. These tongues were cut on the tablesaw with a dado head. The goal was to have a snug fit in the groove but still allow them to expand/contract with seasonal changes. Everything got two coats of the Watco, it wouldn’t have been possible to get the oil into the grooves and on the tongues if the finish was applied after the top was assembled. Care was taken to avoid getting any of the finish on the joints. You can see the tongue cutting process in this picture. Now it was time to see if the calculations were right; as the dry-fit began my concern was that the ends could splay outward if they were pinned before assembling the opposite. After all of the pieces were slid into the grooves loose I saw that was not a concern. Everything was dissassembled and given two coats of the Watco Exterior oil. I used Titebond III Ultimate on this project. After drying overnight, the clamps were removed and two #16 brads were centered to secure each infill piece. To keep the gaps uniform spacers were made out of some 1/4″ MDF and a guide for pinning completed the operation. My thought is that this is similar to breadboard end construction and will prevent too much cupping on the top — any opinions from you other woodworkers reading this blog?, love to hear them. The last step was drilling and counterboring the holes in the legs to attach the top. Sounds simple enough but it’s a three step process which began by drilling an oval counterbore with a 3/4″ forstner bit followed by a slotted 1/4″ hole for the screws. A fence set up on the drill press kept things aligned. The slot is so the top can expand/contract during those seasonal changes without fear of splitting apart. 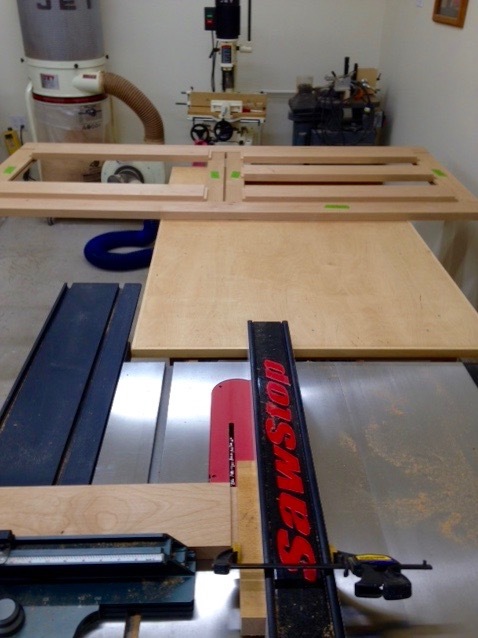 Some friends and neighbors have mentioned that the table top reminds them of an entry door. This design and way of making a top is not one I’ve seen before (although sure it’s been done) so I’d appreciate any comments from you other woodworkers that read this blog. My thoughts are that only does the gap between the infill pieces add a style feature but also that as the years go by, the table won’t do like outdoor tables tend to do which is cup and warp all over. This entry was posted in Patio Table and tagged Alder, counterbored mounting holes, designing outdoor furniture, expansion and contraction of wood, Patio Table, Titebond III Ultimate, Trestle table, Watco Exterior Oil, wedged tenon design. Bookmark the permalink. 3 Responses to Patio Table is Done! Very nice looking table from every angle. I especially like the two-part center rail with the gap. My experience with outdoor furniture is limited, and showed me the importance of allowing for expansion. All I can offer is that your methods look far better than mine! This turned out wonderful,I couldn’t be happier! There is just something about alder that I just love. Great looking table, I look forward to seeing how it ages.